If you have lived in Utah for any length of time you have heard about how poor the air quality is. And if you have lived here through winter, you’ve seen firsthand how bad the air is. Many people may think that when they are inside their homes they’re protected from the air outside, but they would be wrong. The EPA says the air in our homes can be 2-5 times worse than the air outside. This is because of how well our homes are being built these days--they are sealed up tighter to be more energy efficient. But this can cause the air in our homes to be trapped and get stale. Before you think better air quality in your home is a lost cause, here is some information you may want to consider: Your Heating, Ventilation, and Air Conditioning (HVAC) systems are able to help. 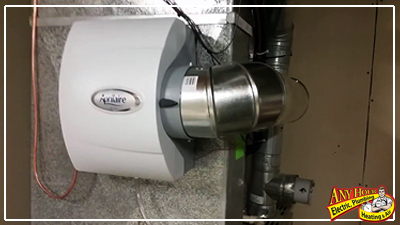 There is equipment that can be installed/retrofitted to an existing forced air system to help purify and clean the air in your home. The three most common air quality upgrades are whole home humidifiers, better filtration, and germicidal UV lights. Utah is among the driest areas in the country to live. There are pros and cons to living in a dry climate, but our health and homes would benefit from a balanced approach to humidity levels in the home. This balance is easily achieved with a whole-home humidifier. Humidifiers help prevent respiratory issues, dry skin, scratchy throats, and bloody noses. It can also reduce the severity of allergies, asthma, and eczema. Every HVAC system comes with basic filtration, which serves to help keep dirt and dust out of the internal components of the equipment. 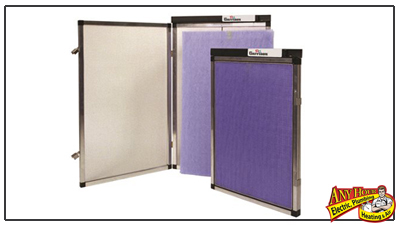 This can also help filter particulates such as dust and pet hair out of the air. A reusable carbon-based electrostatic air filter takes filtration a step beyond, helping to remove odors, dust mites, and pollen. An added bonus is that electrostatic filters don’t wear out, so they can even help you save money because you won’t have to buy new filters. It is impossible to see with our eyes, but germs, bacteria, and mold can be in the air we breathe. Germicidal UV lights are used in hospitals to kill these airborne problems and reduce the spread of sickness. The same technology is available on a smaller scale for our homes. 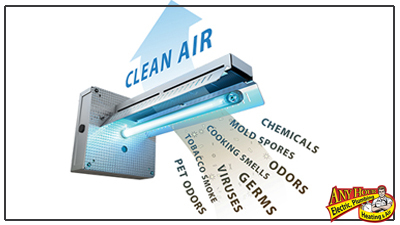 Installed in the ductwork of your HVAC system, germicidal UV lights can help disinfect the air you breathe. Whether you have a compromised immune system, kids bringing home germs from school, or you work around other people and want to avoid getting sick and missing work, a UV light could help. And, for the month of February, Any Hour Services is helping homeowners by installing an upgraded indoor air quality package for FREE with every Carrier furnace install. This package has a $2,500 value that they are giving away in an attempt to keep their technicians busy until summer hits. If you are in the market for a new furnace and you would like to know what options are available, call Any Hour Services and schedule a time for one of their HVAC supervisors to come to your home. They will measure and calculate everything needed to make sure your new furnace heats your home the way you would expect it to. And if you decide to have Any Hour Services install a new Carrier furnace, they will install an upgraded indoor air quality package along with it, which includes a whole home humidifier, electrostatic air filter, and a germicidal UV light, FREE. For more details call 801-692-0455 today. Your new furnace must be installed on or before Thursday, February 28th, so call today or go to our contact page and schedule your free appointment.